Unfortunately pegs cannot be booked so it is first come first served!!.. The best advice is to call before you travel to check how busy the lake is. 07901923701 Tom. link to video of carp spawning on the specimen lake spring 2012. Three large carp pairing up before spawning. Hudsons Farm Fishery has a CEFAS license for wels catfish. We have several cats well over 20lb in the specimen lake. Nathan Pickering with a large cat from peg 7 on his first visit to the specimen lake. 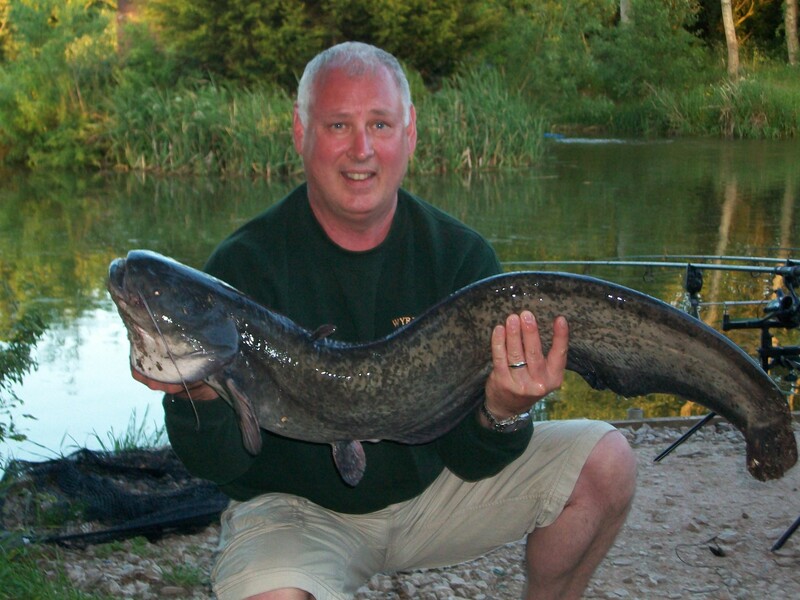 Doughie Shaw with a nice 20lb + cat caught on peg9. 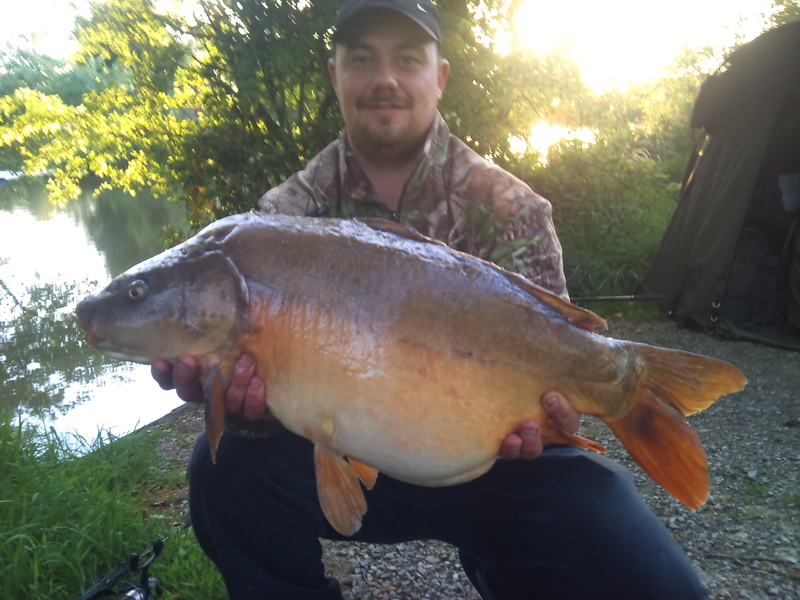 Tom Ball with a Nice Mirror peg 6. 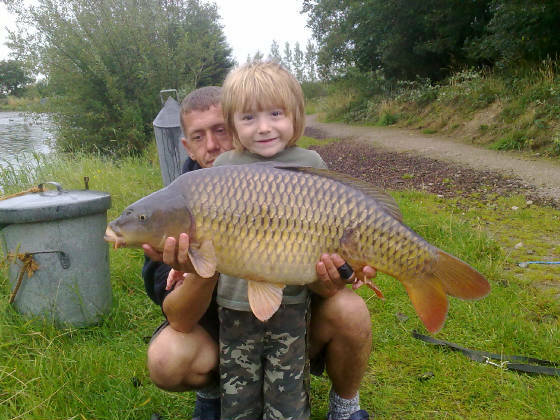 Guy and son with a nice common peg 3. A note about rigs . The use of LEAD CORE LEADERS , KORDA SAFE ZONE LEADERS, OR ANY FORM OF LEADER has been banned for some time , do not use them , as in the past i have had fish tethered by them . If you are in doubt about you're rig please ask the bailiff for advice , he will help. Lead clips / inline lead are fine, as long as the lead can drop of the end if the line were to break. Micro / whisker barbs or barbless are fine. Unfortunately pegs cannot be booked so it is first come first served!! No day tickets for the specimen lake on Friday /Saturday 24hr tickets only . I have finished remodelling the pegs on the specimen lake , there are now only 9 numbered pegs in total so this should help to simplify things ( we hope ) pegs 1 - 5 have been lined with chipped-barked and are now more bivvy friendly. Pegs 5 8 and 9 are double pegs, so can be fished by one or two angler. The entrance gate is unlocked at 8 am re locked at 9 pm or dusk last entry 7.30 PM the site is fully otter fenced , you are locked in at night . The specimen is probably the first lake you will see when you drive into the car-park, it is on the right. 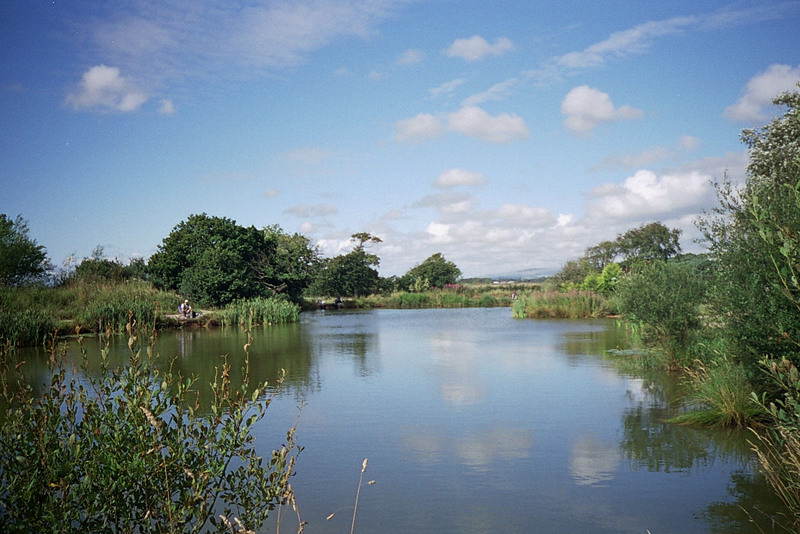 A very well established water (over 100 years old) the specimen lake is very well known in the area for being a beautiful carp lake were you have a good Chance of a large carp. When it comes to boilie flavours, I would always advise sticking with what flavours you are confident in using, most of the dynamite range seem to produce well on here. Large halibut pellet can also work as can pepperami. This water (like all the others) has lots of fish holding features: lily and reed beds over hanging trees an island and underwater features - drop offs etc. Unfortunately pegs cannot be booked so it is first come first served.